On Thursday, Vermont senator and Democratic primary runner-up Bernie Sanders delivered a hotly anticipated speech online, an address to hundreds of thousands of ardent supporters about where his campaign has been, what's next, and his long-term vision for the future of the Democratic Party. And he was not short on suggestions ― here's perhaps Bernie Sanders' most important piece of advice for Democrats going forward. [The political revolution] means that we can no longer ignore the fact, that sadly, the current Democratic Party leadership has turned its back on dozens of states and has allowed right-wing politicians to win elections in some states, with virtually no opposition. Including some of the poorest states in America. The Democratic Party needs a 50-state strategy. We may not win in every state tomorrow, but we will never win unless we recruit good candidates, and develop organizations that compete effectively in the future. We must provide resources to those states which have so long been ignored. There's a certain dramatic irony to this suggestion, given the way his campaign went, and some of the excuses he was forced to make for his poor performances throughout the American South. Sanders' pitch to the Democratic electorate, for a time, was that Clinton was beating him in conservative Southern states, ones that would never vote for a Democrat anyways. But, perhaps somewhat informed by that experience, Sanders is now making an astute and hugely important plea to the Democratic Party's leadership. After all, even if he wanted to, he really couldn't have organized a full-fledged 50-state strategy on his own, in the thick of a presidential run ― the strategy is, by its nature, a long-term one, the kind that demands a years-long commitment at the level of the Democratic National Committee. Properly done, it's way too big for any individual candidate. For what it's worth, the DNC has backed a 50-state strategy before. Quite famously, in fact ― former DNC chairman Howard Dean was a big proponent of campaigning and organizing in all 50 states, and the strategy was partially credited both for big Democratic gains in the 2006 midterms, and for helping President Obama compete in typically red states like North Carolina and Indiana in 2008. But to really work its intended magic, a 50-state strategy needs to be kept in place and made to thrive for years and years, spanning multiple election cycles and (in all likelihood) different DNC chairs. That makes it less likely to truly succeed in the long-term, because it's not a universally accepted notion ― many Democratic leaders opposed Dean's efforts at the time, on the grounds that heavily targeting battleground states was more useful. Perhaps the most notable opponent of Dean's plan? The now-embattled and controversial Mayor of Chicago, Rahm Emanuel. This, for the record, is not the first time Sanders has made his preference for a 50-state strategy known. To the contrary, he's been trumpeting this as a Democratic necessity for months, and it'll be interesting to see whether it's an issue he's willing to spend his remaining political leverage on. 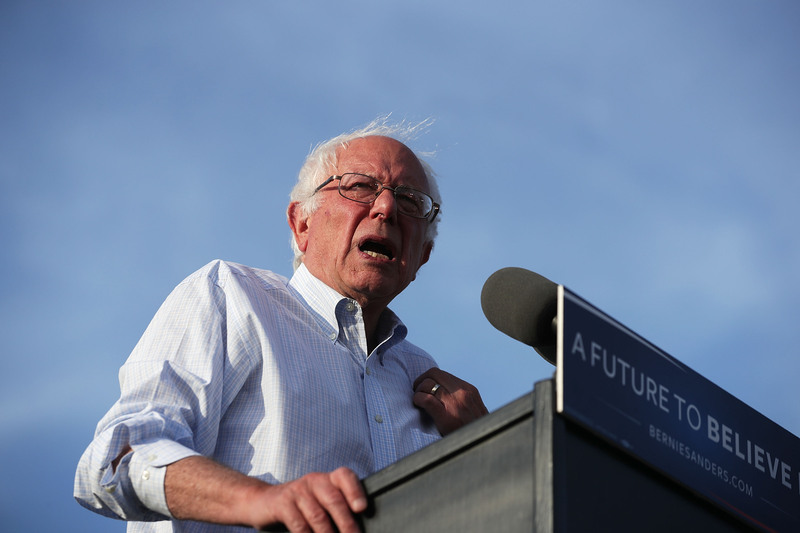 After all, Sanders is still a Democratic candidate for president, despite having no credible route to the nomination, and he's not lobbing any more rhetorical bombs at presumptive nominee Hillary Clinton. Rather, he's trying to keep that grassroots spirit and his own political influence strong clear through to the Democratic National Convention, meaning he probably has a least a few big asks in his back pocket.